“Oh, wonderful,” you’re saying to yourself sarcastically. “She’s doing another Toca Boca review.” Please, resist the urge to roll your eyes. But before you decide that checking your Twitter feed is infinitely more exciting than the following review, do me a favor and download Toca Tailor Fairy Tales – it’s free for a limited time. I can wait; there’s a lovely chai latte waiting for me over in the kitchen. Got it? Good. Now you will finally understand why it is we go nuts over Toca Boca apps. One of the biggest seals of approval for an app in our house is if both of my kids not only enjoy it, but can also play it with ease and without frustration. For reference my son is closing in on 5 and my daughter is halfway to her third birthday. They are as different as night and day, both in personality and skill levels, so finding a common iPad ground has proven to be a difficult challenge. A challenge that developers over at Toca Boca have taken on with quirk appeal and a distinct appreciation of what makes a universally enjoyed app. fashion designer, choosing clothing details from fabric to accessories and everything in between. Fairy Tales wanders into the realm of beloved childhood fables with themed clothing and accessories that you would easily find in pictures depicting tales of yore. 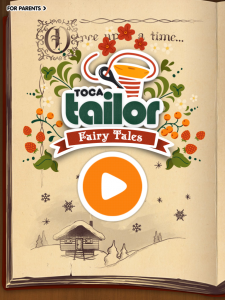 Game play is quite the same as the regular Toca Tailor, and while the two similar apps fuel the creative process of young minds, Fairy Tales ventures into the arena of promoting story telling. The app opens with a page of a book with “Once upon a time…” boldly written at the top, enticing children to start thinking of their own story to tell. It can be a fable about a beautiful princess with the bold floral peasant top or how the little boy in farmer’s clothing becomes a valiant knight in shining armor. My son particularly loves making up stories, especially at bedtime as an alternative to our dog-eared paperback favorites. He could go on for hours if I let him, introducing characters that are strikingly similar in temperment to those with whom he interacts daily. (The mean dragon named “Mom” – coincidence?) This app gave him a visual representation of the imaginary protagonists that, up until now, existed only in his busy little brain. 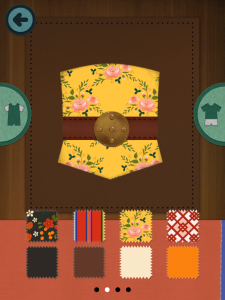 Raconteurs of all ages will find this app to be a wonderful addition to their story-telling process, but take advantage of the limited free download. Now if you’ll excuse me, I need to go breathe some dragon fire on my chai; it’s gotten cold. – I’m almost embarrassed to say “None”, but it’s really true!